To make sure we’re on the same page, let’s look at the function of the crown. It’s the part of the tooth that sits above the gumline and using the protective outer material called enamel, it protects the precious area inside – the dentin, pulp, canals and nerves. If the crown is severely decayed or broken, these areas are left exposed to food and beverage particles and bacteria. Tipping – This is the lateral shifting of teeth directly adjacent to a missing tooth. If this occurs, there will be occlusion problems and greater susceptibility to infection. Super Eruption – When a tooth is missing, the one directly above or below it can move from its roots in an attempt to find the healthy degree of tension necessary to maintain jaw stability. This is called a super eruption and causes the same problems as those listed above. In times past, the only option for a crown restoration was to place metallic fixtures in the mouth. Thankfully, with the technological advancements in the world of dentistry, there’s a much better way available. 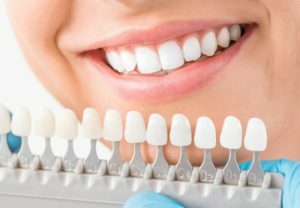 Patients can now enjoy the full function of their teeth while maintaining the aesthetics of their smile with dental crowns made using the CEREC method. Incorporating an advanced software called CAD, your dentist in Hackettstown can fabricate a tooth-colored, porcelain crown in one visit using an in-office milling machine (CAM) that interprets the specifications sent using the CAD software. That means no gooey molds, temporary crowns or extended waiting period while a lab creates the permanent fixture. With the CEREC method, you’ll leave your dentist’s office fully restored in one visit. To take advantage of the opportunity to regain the look and function that you desire with a dental crown, it’s important that you take a more proactive approach. Missing a tooth for a prolonged period of time will lead to bone loss while waiting to repair a weak tooth could result in losing it. To take advantage of the opportunity to be fully restored and prevent any of these problems, reach out to your local dentist to schedule an appointment today. Dr. Arindam Kakkar earned his dental degree from NYU College of Dentistry and has gone on to provide precise and compassionate dental care for over a decade. Specializing in same-day crowns, full-mouth restorations and several other modalities, Dr. Kakkar helps patients regain the lives they once had at Skylands Dental of New Jersey and can be reached for more information through his website.